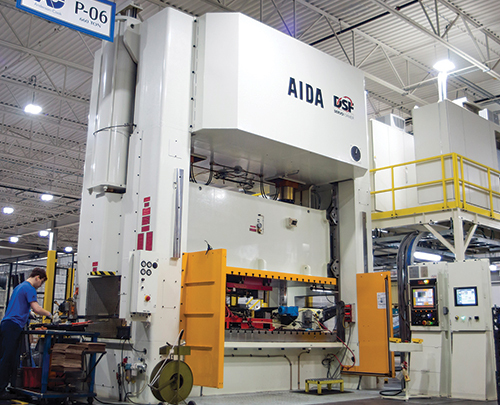 Omex Manufacturing ULC, Stratford, Ontario, Canada, has realized part-quality and productivity gains following the installation of its first servo-driven press, a 630-ton DSF-M2 model from Aida America. The direct-drive servo press also includes a rear transfer and a walking-beam part feeder. Omex, a global supplier to automotive and other markets, moved the stamping of an automotive spindle from a mechanical press—which presented a compromise between part quality and needed production speed— to its new DSF. The servo press’ longer stroke allows more time for automation equipment to do its work, as well as the capability to create an optimized motion profile for the part. Omex also increased production speed by taking advantage of the infinitely programmable stroke and velocity profiles unique to servo presses. The manufacturer incorporated three speed segments into the servo-flex motion profile currently employed to produce this spindle: one optimized for the transfer, one optimized for the forming portion of the stroke and one set at maximum press speed to more rapidly open the die. The result: Omex improved part quality, increased production speed by more than 20 percent, and reduced the scrap rate by 1.5 percent. The improved part-to-part dimensional capability on the new press reportedly has led to fewer process adjustments. Additionally, Omex reports an increase in tool life of 15 percent, and now experiences longer intervals between die maintenance. Omex’ new press features Aida’s proprietary high-torque, low-speed servo motor, designed and manufactured by Aida specifically for heavy metal stamping applications. It also includes zero-clearance roller slide guides, which create a lubrication-free die space and prevent cross-contamination of die and press lubricant, according to Aida officials. The press also includes a communications port for remote diagnostics via eWon, standard on all Aida DSF-M2 servo-driven presses. Options included on the new Omex press: column-mounted light curtains, and an integrated four-channel, strain-gauge-type forward- and reverse-tonnage monitor with signature analysis. Die protection control and programmable limit switch circuits, both with sensors interfaced and stored in the job-recipe memory for rapid setup, also are included, along with an automatic counterbalance control with an electric-controlled pneumatic regulator that automatically sets slide-counterbalance pressure during die setup. Servo feed control integration is included to seamlessly integrate with a third-party part feeder. And, inclusion of the servo press/servo transfer integration interface option provides a virtual encoder conditioned for flex and pendulum motion profiles to any third-party servo transfer control.